There’s nothing quite like a cool Popsicle on a hot summer day. Ditch the store bought variety loaded with sugar and artificial food coloring and make your own healthy treats. Pretty much any smoothie recipe is a candidate to make Popsicles with. However, this recipe is particularly tasty, cooling, and not too far from the real thing. Oranges and lemons are high in vitamin C and a good source of fiber. In order to maximize the amount of nutrition you get from these citrus fruits, you want to eat the entire fruit, minus the outer skin, or peel. The pith and pulp are loaded with nutrients. Keep this in mind when buying or making your own juice (pulp is good). The Popsicle molds (BPA-free) seen in the picture above were purchased from Amazon.com. Sizes and flavors of oranges and lemons will vary. I recommend sampling the drink before pouring into Popsicle molds to ensure it’s sweet enough. If you have left over liquid after filling your molds, add ice and enjoy. Place all the ingredients into your high-speed blender and blend for around 30-60 seconds. 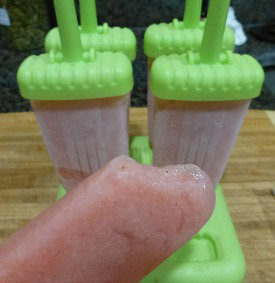 Pour the liquid into Popsicle molds and freeze. Enjoy a couple hours later. For more deliciousness, check out my Blueberry Yogurt Smoothie Popsicles. I would love to know if you try these citrus smoothie Popsicles – please leave a comment below. Happy Blending!